Is it too late for coffee or too early for wine? That’s a question Madeline Burke has come to ask herself all too often. She needs a change, and a big one at that. Coming into her late 20s, she finally finds the courage to pull herself out of a boring 9-to-5 life in Texas and launch the exciting new career she’s always dreamed about. Thanks to a little chutzpah and some quick thinking, she has landed an internship working in film publicity in New York City. It’s her favorite city in the world, concrete jungle where dreams are made…or crushed. The prospect is both exciting and intimidating for a woman with an ambitious work ethic and a pesky anxiety problem. What could possibly go wrong? As Madeline goes behind the velvet ropes of movie premieres and celebrity press tours, she finds out what really happens after the cameras flash. Navigating her way through splashy scandals, inflated egos, romantic entanglements, and impossible office demands has her catching her breath behind one too many bathroom stall doors. The hectic and fast-paced reality that is her new life has her questioning whether or not she has what it takes to stick it out. She decides it is up to her and her alone to make it in New York City. As the saying goes, if you can make it there, you can make it anywhere…right? This was my first time reading this author. The plot moved along well and the characters were lively. I enjoyed the twist and turns of the story. Well done! I was immediately drawn to this book for two reasons: 1) The cover is absolutely gorgeous. The pastels reminded me of warmer weather. 2) The opening line from the blurb: Is it too late for coffee or too early for wine? As a grad student who is stressed out all time, I can’t even tell you the amount of times that I have asked this very question. The story opens with Madeline Burke on a plane headed to finally start a career in the film industry in New York City while leaving a not so thrilling career in business development at software company behind in Houston, Texas. Madeline realized she needed to leave her mundane life in Texas after asking herself on a daily basis if she could start drinking at 2 pm. Unfortunately, Madeline suffers from both anxiety and panic attacks, which while mid-air, is not the best of situations. She ultimately pops some Xanax and allows herself to be lulled into a semi-peaceful bliss. When Madeline starts her new position, it is nowhere near as glamorous as she envisioned. Her boss clearly has a grudge against female interns, which means Madeline is mostly filling the coffee orders. Madelyn finally gets the opportunity to attend a premiere packed with celebrities, but once photos of one her celebrity clients in a compromised situation appear splashed across the front page of the tabloids of a certain celebrity, her boss accuses of her selling photographs. Thankfully, at least Madeline can count on her colleagues Adi and Carolyn. Madeline’s life begins to change when she meets Adi’s cousin Drake who’s a police officer who works security part-time at the film premiere events and happens to be GORGEOUS. The only caveat? Drake’s not looking to pursue a relationship. He’s been on a dating hiatus since his previous engagement went south, which was over two years ago. However, as Madeline and Drake start spending more time together, it is evident that sparks have flown between them and sexual tension begins to build. This book has everything that I typically look for when it comes to a good contemporary romance. The plot was fast paced. The book is incredibly witty not only when it comes to Madeline’s interaction with the other characters, but even the thoughts that she has. Madeline’s character is relatable. She moved across the country to escape a mundane life to pursue a once in a lifetime opportunity, which is not all that it’s cracked up to be at first. (This definitely reminded me of when I started graduate school after leaving a comfortable life in industry) I also enjoyed that the romance in this book is not the over the top love at first sight type of romance. There’s hesitation and trust must be built between Madeline and Drake. Lastly, there’s a plot twist, which was a pleasant surprise. Overall, this is a fantastic debut novel and one that you don’t want to miss! Once I started reading, I just couldn’t stop. Thank you to the author for providing an eARC of this book. This did not influence my review. All opinions are my own. YES! I have hit a bit of rough patch with my reading choices lately, and If I Can Make It Here came along at the perfect time to get me back on track. The cover immediately called to me, but the synopsis had me hooked. New York, working with celebrities … I was all to jump into this chick lit story and had such a fun time reading it. Madeline is a sweet lead, moving from Texas to New York and working in film publicity, knowing no one in the big city. Drama ensues with her internship, not with the celebrities but those who work with her, and I was constantly rooting for her to get the respect I thought she deserved on the job. We of course have a romance angle in here and I loved it! There are so many moments that made me smile, laugh, cringe, seethe, and also plenty of scenes that I found relatable, even though I live in Iowa and do not work on the daily with celebrity clients. If you are a chick lit fan, I highly recommend! 5.0 out of 5 starsSo good! You won’t be able to put it down! 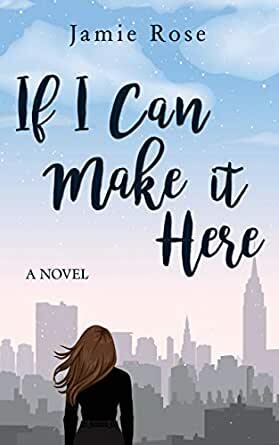 The debut novel, If I Can Make it Here, is so entertaining- a book that will grab your attention from the beginning and have you turning the pages all the way to the very end! With each chapter, it leaves you wanting more and you can’t wait to see what happens next! This book has everything- good girlfriends, New York City, A-list celebrities, job struggles, romance, mystery, suspense, witty humor that will keep you laughing, and a girl so driven that she will do whatever it takes to chase her dreams! What’s not to love? Trust me, read Jamie Rose’s If I Can Make it Here, you won’t be able to put it down! 4.0 out of 5 starsYou'll be rooting for Madeline the whole way through! Jamie Rose's debut novel, If I Can Make it Here is such a feel good story that is packed with funny moments, hilariously witty conversations, romance and an all to relatable protagonist! As the reader you get to go along for the complicated ride that is Madeline's life in New York; the troubles of working in film publicity, dealing with celebrities and horrible co-workers, creating amazing friendships and the ups and downs of romantic relationships! Madeline is driven to make it in New York City and she won't let anyone get in the way of her achieving her dreams. If I Can Make it Here will have you laughing, swooning and rooting for Madeline the whole way through!